Step 1 Heat the oven to 375 degrees. Peel, quarter and core the quinces, and cut them into one-fourth-inch slices. Place them in a 9 1/2-by-11-inch baking dish, along with the orange juice, white wine and one-third cup sugar. Slice the vanilla bean and scrape the insides into the dish. Stir to combine, cover with foil and roast for 1 hour. Step 2 Opening the oven briefly, lift the foil and stir the quinces. Roast another hour. Repeat twice, for a total of 3 hours of roasting time. Let the pan cool, then chill for 1 hour. Step 3Divide the dough in half. Keep half in the refrigerator and roll out the other half into a 13-inch circle one-fourth-inch thick. Fit it into a buttered, 9-inch pie plate. Fold the edges in and down to form a three-fourths-inch overhang all the way around the pie. Chill it in the refrigerator. Step 4In a large bowl, toss together the apples, one-third cup sugar, one-half teaspoon cinnamon, the nutmeg, cloves and cornstarch. Add the applesauce, vanilla extract, melted butter and roasted quinces and gently toss again. Fill the pie, mounding the filling gently. Chill. Step 5Roll out the remaining dough into a 13-inch circle, one-fourth-inch thick. Take the pie from the refrigerator and drape the dough over the top of the filling. Fold the edge forward, dropping the dough into the crevice between the mound of filling and the side of the plate. Lay the overhang of dough onto the bottom lip. Use scissors to trim, leaving one-half-inch beyond the edge of the plate. Crimp in a rustic fashion. Chill for one hour. Step 6Heat the oven to 350 degrees. In a small bowl, whisk the egg. In another small bowl, combine the remaining 3 tablespoons of sugar and one-fourth teaspoon cinnamon. Brush the surface of the pie with the egg, then sprinkle it with the cinnamon sugar. Use the tip of a sharp knife to imprint a star design onto the top of the pie, cutting only halfway through the dough, or decorate with leaves cut out from extra dough. 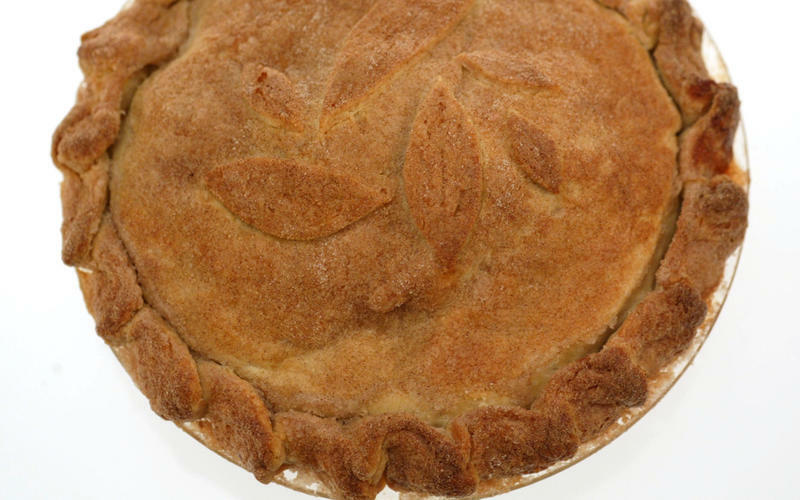 Pierce a hole into the center of the pie to allow steam to escape. Step 7Bake until shiny, dark golden-brown and bubbling at the edges, 1 hour and 50 minutes to 2 hours. In Recipes-list.com we have selected the most viewed recipes from category - Desserts . Enjoy the best recipes specially selected for you! Apple-quince pie is the right choice that will satisfy all your claims.